SPDP Puteri Barbara P205..Mere Rumours..?? Various names have been thrown into the fray including Chambai Lindong,Jasmys Sadan Sagi,Dr,James Chella,Enturan Lupa and even some imported non party members names have been seen to make appearances in this constituency. This article which appeared in todays mainstream media throws another possibility to the seemingly crowded “interested and winnable” candidacy of P205. Now the Puteri Chiefs name has been thrown into the “shark infested waters of political haggling and lobbying and many will be taking an opportunity to defame,slander her and accuse SPDP President of using his position to build his legacy. Does Wiliam Mawan have any choices? Mosts Parties groom their own to take over the helm and the likes of DAP( Lim Kit Siang-Lim Guan Eng) MCA (Chua Soi Leck-Chua Tee Yong) PKR( Anwar Ibrahim-Nurul Izzah) UMNO (Mahathir Mohamad-Mukhriz Mahathir) PBB ( Taib Mahmud- Sulaiman Abdul Rahman bin Abdul Taib) and the lists goes on. Even the USA and Philippines Presidents like George Bush,Marcoses,Aquinos are looking at legacies. Is it Wrong for William Mawan to even think of that.? Times have evolved and change. Nowadays its not the symbol but PERSONALITIES. Politics nowadays is Borderless and Malaysian Parliamentarians are watched upon like “hawks eyes“by the international media. The political parties have no choice but to listen to the ground”people want to choose the leaders who can deliver,work for them and speak for them in Parliament” The other criterias of humblensess,popularity,acceptance are secondary now. Its not about Barbara Mawan here but given the party is facing an onslaught from PKR and the words which are unretractable which we publish again here it gives SPDP that chance. WILL ALI BIJU STAND DOWN? Extracted:-“Word has got to the ears of an aide close to the PKR assemblyman. He said,”any other persons nominated by SPDP our YB will not stand in the parliamentary seat but if SPDP was to renominate Jelaing or put in Nyarok, there is every chance that he will seriously have to reconsider. There are so many factors for SPDP elections committe to consider and the words of Barbara Mawan,”am more willing to play a complimentary role in the party” is more than a political statement and we should not rule her out. Puteri UMNO is a Sabahan and now a Deputy Minister and Sarawakians should be proud too if SPDP Puteri does get her chance to prove her worth to be speaking for the many young women in Sarawak too in Parliament. She herself knows that she will be entering”SHARK INFESTED WATERS” where every bite will be painful to swallow and her mental strength needs to be boosted up. audie61 should be amongst the first to inform the readers if she takes that road and embark on another journey of her life. WE SHALL SEE WOULDN’T WE.?? The early morning calls this morning concerned Sarawak DCM Jabu .The headlines didnt help him much as it implicates,”Many Quarters believe Jabu is CM Material.” Tun Rahman former Chief Minister and Uncle to Taib has put the cat among the pigeons when he said,”Since Jabu was PBB Deputy President he was in effect a representative of all races in Sarawak and therefore the bests person to become Chief Minister. DCM Jabu was quick to put a stop to all the speculations as the situation might just get out of hand. He issued a statement ,” At this point in time, replacement and succession of the Sarawak chief minister should not arise and should not be speculated upon,” Jabu, who is Parti Pesaka Bumiputera Bersatu (PBB) deputy-president, said in a statement today. 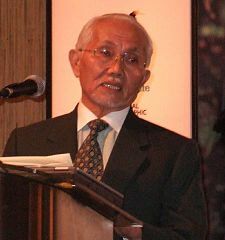 “I have consistently and publicly said that I have full confidence in the very capable, fair, competent and visionary leadership of Abdul Taib as Sarawak chief minister, and fully support his continued leadership as chief minister,” he said, adding that he was fully committed to work as a team player in PBB and Barisan Nasional (BN). 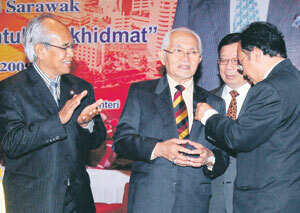 Over the past ten years there has been names being put forward to succeed Taib Mahmud. The names of Adenan Satem,Effendi Norwawi,Abang Johari,Awang Tengah and Sulaiman Taib just very recently has rolled off the tongues of most political analysts. These names will continue to be touted as possible successors as the Puppet Masters continue to pull the strings. Jabu has flatly denied with the statement above but can we rule him out when the time comes? The Puppet Masters will ink their approval on the CHOSEN SUCCESSOR.. The whole hall erupted with shouts of “Hidup Taib,Boleh,Boleh Boleh..Setuju Setuju,Setuju .There will be some who will just try to catch some breadth after the unexpected call by the President as many would have thought he is ready to hand over after being at the helm for over two decades. Taib would encourage Asfia his most able Lieutenant to hatch this plan and ensure it works. Taib would be very careful not to anger either Johari’s or Tengah’s man and he will use this as and inform the inner circles within PBB that Effendi is the bests person to take over. Up till today Taib has never ever not trust his protege eventhough Effendi has more than once turn him down mostly using his usual health reasons. Of course the bigger picture is to coax his son Sulaiman to take over after giving him time on a ‘Sabbatical” according to Taibs closest aide. Effendi will sit in temporary to warm the seat before the return of the Prodigal Son. Classic huh.! Why not just Johari or Tengah? Johari is very Senior but does not have Federal appointment experience and likewise Tengah. Johari does not have the full support of the Melanau PBB support but Tengah has but Tengah does not have full Pesaka ‘dayak”support. Effendi does not have grassroot but has Federal support and he seems to be able to balance both Tengah and Johari factions and also neutralise the Pesaka Wing. 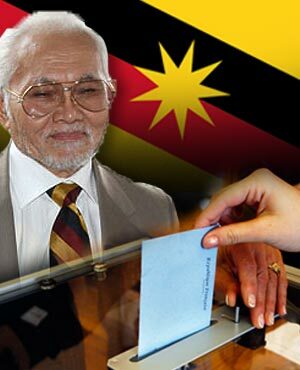 With just this speech Taib would be able to continue to stay in power and lead the BN in the next State elections. The successor issue would be put in the cupboard for now and Taib would be able to carry on with his agenda with the Mandate obtained from the majority of PBB members in the convention. He has profitted from this convention though it could be his last dance but its a well worked poltical coup of some sort. Taib according to his aide has gone back to his drawing board a few times to readjust and realign. Would you dare just rule this scenario and plan out..? They always say nothing in politics surprise me anymore and this could just be one of them…Nothing indepth needed in this political plan but plain shouts of boleh,boleh,boleh………..
We witness Mahathir crying on stage at the tail end of his career.Will you use this or come up with another original.What if you have used all other options? Dont think to hard would you…. An internet portal posted an article which it seems to have stemmed up from the dissatisfaction especially with the recent resignation of its Vice Chairman from the Federal Appointed posts. The media they say will jump into any story that will shake the administration and create some ripples. Of course the bloogers in the blogsphere will add more gravy plus implicit details and facts to give it an added spice. Is PBB Youth in a bad shape with its leader spending too much time in the Federal capital? As for Karim he sms me and said,”He has been there before and he is not too keen” You make your own judgements after you read what has been posted….. In football, normally an experienced coach would get his reserve striker to warm up if the top marksman is firing blank. That is what a group of vocal Pesaka Bumiputera Bersatu (PBB) youth leaders are doing. They have been going around, hinting and signaling that the Youth Chief post should be contested. I am sure Fadillah Yusof, the incumbent is fully aware. I have not met Fadillah in person since Batang Ai by election, the very last time am got to meet Malcolm Mussen “The Invisible YB”. PBB is a very complicated political party. They are two entity under one roof. Very united despite the sibbling rivalry. The unity in PBB is partly because they have a very firm leader in Abdul Taib Mahmud and Alfred Jabu. Discontent leaders have been very vocal during PBB youth executive councils meeting, most of whom demanding what was promised during the party closed-door Triennial General Meeting (TGM). PBB last TGM was a family affairs, and doors are nicely shut for the press. One of the issues brought up was lacked of activities due to Fadillah extremely tight schedule in his Ministerial role. Critique said that Fadillah is embroiled in the unique situation due to very special circumstances. Suffice to say that he is blessed with a non-politician as his vice on Bumiputera ticket. There is no need for me to mention the name because every PBB members and supporters active at grassroots level are fully aware of it. It was learnt that some PBB youth leaders are not happy because the wing is unable to make their presence felt apart from failing to create viable opportunities for member and supporters. “They may organise this economic course and that opportunities course but there were literally no follow ups.” One of the youth leader who spoke with Sarawak Update quipped. Another leader who spoke very frankly, insisted that politic is about sacrifice and struggling for the betterment of the society. Fruits of the labour, whatever little, must also trickled down. They claimed that the movement is slowly losing its appeal and blame this to the collective failure of “Fadillah team” leadership. Off all the names, the person being pushed to challenge Fadillah is PBB loudest voice in state legislative assembly who is former PBB deputy youth chief, Abdul Karim Rahman Hamzah. Karim, whom is also Chief Minister chief political secretary when contacted for comment admitted that he heard about and is leaving it to the party top leadership. “Being in PBB youth was the best part of my political struggle but my peers are already in the Kaum Bapa (main body) and I will be 50 soon,” he said. When pressed for comment, Karim insisted PBB youth leadership must try to solve the problem within the movement, and believed that it is best the movement leader to be elected among themselves. “I am already in the party main body supreme council, and would abide by the leadership advice. Furthermore, I would feel very lonely there though I may be able to join them at coffeeshops, big-biking or other youth activities,” he said. It seems that everyone is looking beyond Sulaimans resignation and we have covered it earlier. This is also an interesting read from an internet blog sarawak update which we copied for all to have. You will have your own preferences and we are still sticking with Alex Linggi and Nora. Whats your choice.?? Dr Jeniri Amir, a former executive editor of Utusan Sarawak turned senior lecturer at UNIMAS is softly campaigning for Wahab Dollah to replace Sulaiman Abdul Rahman given if Prime Minister accepted his resignation, here. Yours truly, however have reservation against Wahab Dollah who happened to be my former big boss and Jeniri big boss. I would prefer a humble and low profile politician like Dawos. Dawos would solve the Bidayuh representation issue, just in time for Sarawak election. But if there is any legal betting, I am not going to waste my money on either Wahab or Dawos because it is definitely going to be on Norah Abdul Rahman. Why? Look at her performance compare to Wahab and Dawos. Furthermore she is Abdul Rahman Yaakub daughter and Abdul Taib Mahmud cousin…. We wrote earlier……The next question is who will replace Sulaiman in the slot provided by Najibs adminstration for a PBB MP. According to our our sources five names does appear in the PBB radars with stong indications for Alex Linggi and Henry Sum Agong( both very senior Parliamentarians) while Hasbibollah,Nora Rahman and Nancy Shukri are both first timers. Could Nora just succeed his cousin Sulaiman and pip others to the posts..
Sulaimans Resignation More Shocking or MACC Boss?? According to an internet blog the resignation of MACC boss is comes as quite a shock to the whole adminstrative system. Various theories and excuses are given for this sudden development and above it all it might just be another political manouevering. The resignation letter of Deputy Minister of Tourism does come too as a shock to mosts of his “machais“. There were already word of it about a month and a half ago but it was not revealed and word has it that the CM was not too happy then with his sons “rash act“. Exactly what happened we do not want to reveal all and as parents most of us will imagine what words came out and the subsequent actions. What would you have done..?? Taib is after all human and he wants the bests for Sulaiman his eldest son and for him to continue the family legacy. Would you have done the same in his position? You would be lying to yourself if you say no,no,no. audie61 had a breakfast meeting with a very close aide of Sulaiman this morning and he has mentioned that Sulaiman might quit as deputy as the signs of a U-Turn looks quite a distant. HOWEVER he will not relinquish his position as an elected MP.This wil quash all rumours about Samarahan getting ready for a Parliamentary by election and Najib will be very pleased nevertheless with such a move. The next question is who will replace Sulaiman in the slot provided by Najibs adminstration for a PBB MP. According to our our sources five names does appear in the PBB radars with stong indications for Alex Linggi and Henry Sum Agong( both very senior Parliamentarians) while Hasbibollah,Nora Rahman and Nancy Shukri are both first timers. Could Nora just succeed his cousin Sulaiman and pip others to the posts? The PBB second echelon leaders are looking at Alex Linggi to be given the opportunity to take over from Sulaiman as he is known to very hardworking,approachable and is always on the ground willing to listen and assist the rakyat to the bests of his capacity. Much can be written about the individual MPS but we know for a fact that Najib does believe that the MPs that works hard and are seen on the ground deserves a chance to be elevated. CM Taib does also believe in “hard work pays off attitude and he will be too pleased to recommend without hesitation if the Big Boss says so. Its all up to what the leaders have in mind and we will only be too pleased if it is not taken away from Sarawak’s quota. So Najib will take it in his stride that it is indeed an opportunity for others to shine be it a new man as the MACC Boss or a New Deputy Minister. The platform is ther for for the person to take over and whoever is tasks will thank his stars that the time is right for him to SHINE BRIGHTLY. No other words comes to mind except that only our parents who wants the bests for us will tell us that the stars are REACHABLE AND TOUCHABLE .